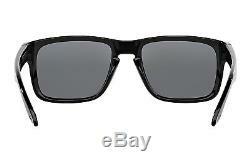 Oakley Holbrook Sunglasses (Polished Black/Gray Polarized). Polarized lenses filter out most glare. Comfortably lightweight O Matter frame. Tested under extreme circumstances to guarantee protection. Protects from 99% of the harmful UV rays. A headache from glare can ruin your day. Golfers have to deal with the performance-killing distraction of glare from water hazards, bunkers and flat areas. Fishing sessions can be futile when blinding rays bounce off water and hide the keepers. Driving in glare can be risky, and road cyclists know how glare can hide potholes and other dangers. Any skier or snowboarder can tell you how glare distracts, diminishes mental focus and drains energy with tension. We developed HDPolarized lenses for elite athletes but our technology serves everyone. Because glare doesn't care if you're a sport champion, weekend warrior or just someone who enjoys the sun. Polarized lenses filter out most glare, but not all polarized lenses are made equally. The best polarized lens is just that - one lens. Oakley HDPolarized Technology eliminates the need for glues and films that distort your vision. Our HDPolarized lenses are in a class by themselves. We use a precise infusion molding process to produce one comprehensive, single-layered lens. No glue, no sandwiching, no mustard or mayo. Just the clearest Polarized lens you can find. Both lenses in a single pair of Oakley sunglasses are manufactured at the same time to perfectly align and center the axis of polarization. Doing so prevents unwanted and distractive glare from sneaking through any part of the lens. 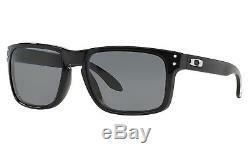 Oakley Holbrook sunglasses are about original style, and it's a clean look of authenticity that makes the statement. 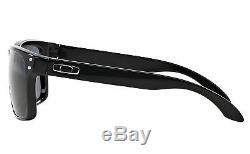 Oakley designed this frame to fit comfortably on medium to large faces. Oakley Holbrook sunglasses feature a polished black frame with gray Polarized lenses, you won't be leaving your house without these shades securely on your face. For optimal all day comfortable viewing, the unique design of the Oakley Holbrook Sunglasses incorporates Three-Point Fit technology. This thoughtful build ensures precision optical alignment of the lens and eliminates pressure points which is a common issue found on traditional wrapped frame sunglasses that hook the ears. Oakley lenses are tested under extreme circumstances to guarantee uncompromising protection against high-mass and high-velocity impact that no other lens offers. We go beyond in precision, dedication and creativity to serve world-class athletes and progressive lifestyle consumers. Our products and technologies don't just provide unmatched performance and quality, they completely redefine the category. An invisible form of radiation, UV rays pelt your retinas at 186,000 miles per second. Eye damage linked to UV includes cataract, photokeratitis and pterygium. UV damage builds up over time. You generally don't feel UV rays, so there is no natural warning that damage is being done. And although clouds reduce the level of UV reaching your eyes, clouds don't block UV completely - which means your eyes can be exposed to UV rays even on overcast days. Oakley Holbrook protects your eye from 99% of the harmful UV rays, so you can go outside knowing your safe. What's in the Box. 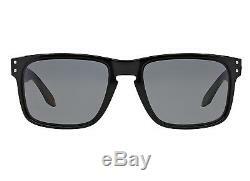 Base Lens Color: Gray Polarized. F There are product categories which are not returnable due to hygienic or sanitary as required by manufacturers. In an event where there is an error regarding a price error or description, we will notify you ASAP. Items removed from their'blister-pack' display packaging are non-refundable. The item "Oakley Men's Holbrook Polarized Sunglasses (Polished Blk Frame/Grey Lens)OO9102" is in sale since Wednesday, May 9, 2018. This item is in the category "Clothing, Shoes & Accessories\Men's Accessories\Sunglasses & Sunglasses Accessories\Sunglasses". The seller is "asavings" and is located in Brooklyn, New York.